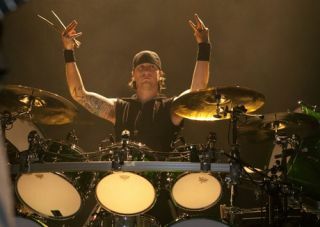 We've just sat backstage with Bullet For My Valentine's Michael 'Moose' Thomas at Download, where we got the lowdown on headlining the Ronnie James Dio Stage, the future for the band and his ultimate festival. You guys must be pleased to be headlining the second stage today. "As a British band it's a massive honour for us to be headlining the Ronnie James Dio Stage at Download. We've got 20 minuets after we finish as well to chug a beer and then catch AC/DC, which is good! I might stick around for tomorrow as well, I'd love to see Rage Against The Machine." Who would you have headlining your dream festival? "Metallica, Iron Maiden, Judas Priest and my band. And then the Cheeky Girls, just to open up. " Are you much of a festival-goer? 'Not really, I've always wanted to play them instead of doing. I went to one day at Reading Festival, but I'm not a festival camping king of person." The reaction to the new album (Fever) has been amazing, you guys must be pleased. "It's been great. It's been a top five record all around the world. It's really nice feeling to be loved by the metal fans." What's next for you boys? "We're doing the festival season for another five weeks then we have six weeks off then we're back out on tour."